For me and many of us, a new year is a way to reflect on the past and how we can improve moving forward. With that being said, don't overwhelm yourself with what you should have done. A New Year gives us the opportunity to make changes to better our lives. One of the ways to help make these improvements is by clearing the clutter from our homes. Having a cluttered home can reek havoc on a person. For example, you may misplace a bill and end up paying it late. Or if you can’t find something because of the clutter, you will end spending more money to replace the item. You may also refrain from inviting family and friends over hurting you and your family from healthy social relationships. A neat, clean and organized home can give you a sense of calm, put control back in your life and add to your bottom line. So, this is a perfect time to get yourself organized for a new and uncluttered life in 2018. Designate a spot for incoming papers - Papers often account for a lot of our clutter. This is because we put them in different spots such as on the counter, on the table, on our desk, in a drawer, on top of a dresser or in our car. No wonder we can’t find anything! Designate an in-box tray or spot in your home and don't put papers anywhere but that spot. This one little change can transform your paperwork. Set up simple folders - Sometimes our papers pile up high because we don't have “good” places to put them. Create some simple folders with labels for your major bills and similar paper paperwork. Your system doesn't have to be complete, but keep some extra folders and labels close by in case you need to quickly create a new file. Learn to file quickly - Once you’ve create your simple filing system, use it regularly. Make quick decisions: trash them, file them immediately, or make a note of the action required and put them in an “action” file. Don't put anything back on the pile, and don't put them anywhere but a file or a maybe box. NO cheating by putting them in the “to be filed” folders! Create a “maybe” box -Sometimes when you’re going through a pile of stuff, you know exactly what to keep and trash. But then there’s stuff you don't use, but think you might want it or need it someday. So create a “maybe” box, and put it there. Then store the box somewhere out of the way. Put a note on your calendar six months from now to look in the box. Go through it at that time and see if there is anything you really need. You will be surprised at how many things in your “maybe box” that end up getting thrown out. Clear off a counter - You want to get your house so that all flat spaces are clear of clutter. Start with one counter an then later another and so on. Clear off everything possible, except maybe one or two essential things. This will give you a sense of accomplishment. When was the last time I actually used it? If the answer is more than six months then it probably needs to leave the house. When would I need it? I might need it someday isn't a good enough rationale. Figure out when and if that someday will occur and if you can't come up with a solid answer then toss it or give away. Do I really like it? This seems like an obvious rule, but it is critical. There is no point in keeping something around if you really don't even like it. Pull out clothes you don't wear - Go through your closet and pull out clothes that you haven't worn in months or years. If they are any seasonal clothes that you use store them away. Get rid of the rest that have not been used by tossing or giving them away. You then will have a closet with only things you actually wear. Pull everything out of a drawer -Start with a drawer and later more drawers when time permits and empty it on your bed or table. Then sort the drawer into three piles: stuff that really should go in the drawer, stuff that goes elsewhere, or stuff to get rid of. Put the stuff back that should go in the draw in a neat and orderly manner. Orphan socks? Underwear you dislike? Toss them. Neat and tidy drawers will help you find what you need. Organizing your home can be stressful at first, but worth it in the end. 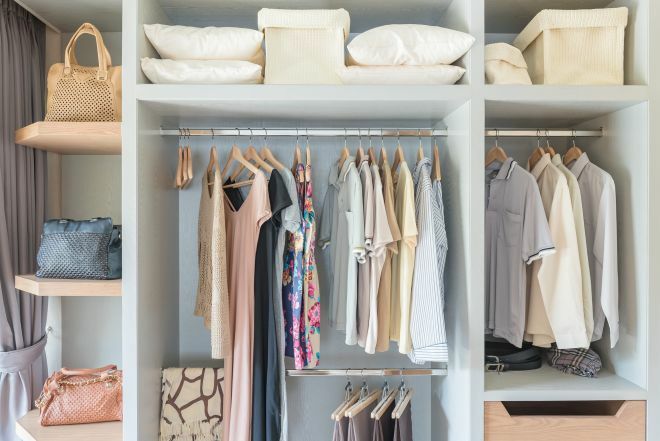 Picture how much better your life will be without the clutter, because getting organized will provide you with more space, less stress, and less mess, and more money. Remember, iGo Realty is here for all of your real estate needs whether it is buying or selling a home. For more details on house values in your area go to our website: igorealty.com or give us a call at (303) 862-5457. Best Wishes for a happy, healthy and organized New Year!